When milk prices are low, investing in a cow monitoring system may not be the first thing on a farmer’s mind. However, studies have shown that reproduction and health monitoring technologies should always be focused on, even in a down economy. Accurate information about a cow’s performance is essential to success in dairy farming. The better you know how your animals feel, the better equipped you are to take the right action at the right time. Adequate intervention will result in higher pregnancy rates, improved lactation, a better health status, and fewer cow losses. CowManager’s revolutionary ear tag provides this information for each individual cow, and fully supports the needs of the dairyman, resulting in not only saving money but in making money indeed. The CowManager users tell you how! The key to success in all transition and fresh cow programs is keeping cows healthy. The transition period is also the moment when a cow’s peak for lactation will be determined. CowManager will alert you immediately whenever a single cow is not eating or ruminating. The resulting early intervention will save you money on labor and antibiotics and will reduce milk drops. However, some results, such as the benefits of improving the herds’ health status, are hard to measure. Michael Johnson of Trailside Holsteins LLC (500 cows) in Fountain, MN, finds that the CowManager Health module offers great support in detecting cows in the early stages of a disease. A typical disease that is hard to catch is sub-clinical pneumonia. Because of the early detection, the affected cows can be treated in an earlier stage, resulting in healthier cows that don’t drop in milk production. Moreover, early detection will decrease the cost of treatments. “With CowManager early detection of mastitis, fresh cow illnesses and sub-clinical infection has been substantial. I am catching the majority of sick cows earlier. In most cases, there is a faster recovery and cows bounce back soon”, according to Michael Johnson. His dead loss also dropped from 8% to 4% since he has been using CowManager. For years, dairy operations have depended on timely and efficient breeding in order to maximize profit. The biggest challenge dairy farms face in this area is ‘heat detection’ or knowing when an individual cow goes into heat. CowManager provides reliable data on heat intensity and heat stage. By combining these alerts with cow data, the system gives valuable insights into the cycles of your individual cows. The system offers you all the information you need for maximizing heat detection. “Thanks to CowManager, we don’t need to use the same hormone program anymore, we use very few shots. Our pregnancy rate went up from 24 to 32%. And, it takes us about 10 minutes to select the cows that are in heat”, Michael Johnson mentions. “Prior to having the CowManager Fertility-module, we were using synchronization at 100% of the herd. Now we are detecting cows in heat and breeding more cows naturally. Our pregnancy used to be 15% and it increased to 22%”, testifies Larry Gartner of Rumpus Ridge farm (500 cows) in Minnesota. “In terms of saving time, we used to spend about two hours every day chalking tails, watching for heats, and checking fresh cows, but we don’t do that anymore. And we’re having better results”, according to Drew Johnson. 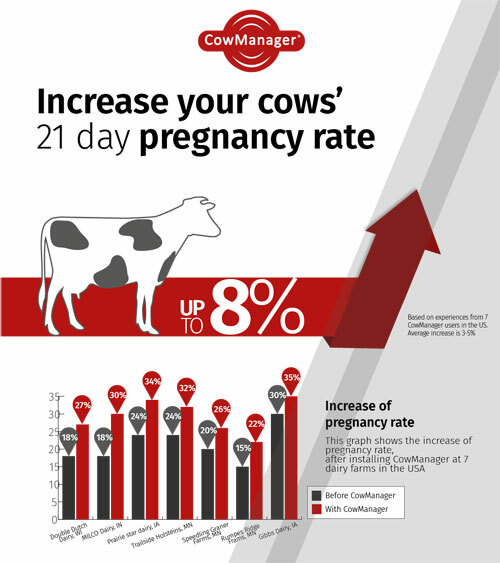 The figure shows the improvements in pregnancy rates with 7 CowManager users in the United States. Early intervention with an accurate cow monitoring system helps you to improve the health and fertility status of your herd. Resulting in a better performing and healthier cow, that needs less medication and (no) hormones. Not only can CowManager help you to be more profitable, it also saves time and labor. Those figures are hard to define in numbers. But our customers can tell you how fast their return on investment was. “The payback time is 1.5 year maximum, but some results are hard to measure,” Michael Johnson explains. CowManager offers different payment solutions that fit easily within the investment plan of each dairy farm business. This way, each dairy can generate more profit with its investment. For more information, visit www.cowmanager.com or follow CowManager on Twitter , Facebook , LinkedIn and YouTube .